Designers Noa Ikeuchi and Tommaso Nani created the Mist-o studio to design and produce contemporary, minimalistic products that are stunning, just by their simplicity and elegance. 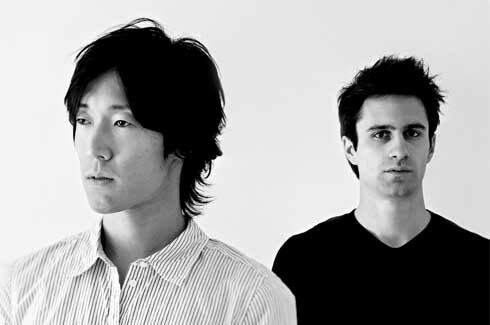 Mist-o is the design studio created by Noa Ikeuchi and Tommaso Nani. The designers, who are from Japan and Italy respectively, met while studying at the Istituto Europeo di Design in Milan, Italy. Ikeuchi and Nani both have successful careers as designers and collaborate at Mist-o to create products for companies such as Cappellini, Living Divani, Grag, Ichendorg and Mogg. 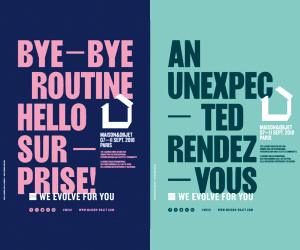 Mist-o’s minimalistic designs are like a breath of fresh air in this presently chaotic design world. Their clean, spare designs would be right at home in a Scandinavian setting or in a contemporary Indian home where the product would be of course – the star. One of their earliest products was the ‘Flamingo’ bookshelf (2009) made of lime tree wood and plexiglas. 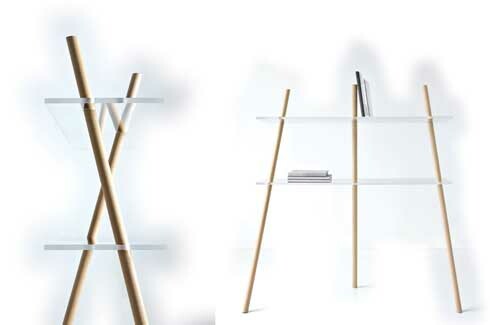 The legs of the bookcase support each other “by sheer force of gravity” and remind one of a flamingo standing on one leg. The plexiglass shelves provide added support to this simple, yet sturdy, design. 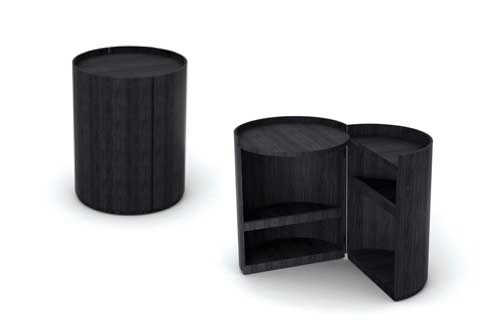 The ‘Moon Beside’ table (2014) is a sultry drum-like table that opens up to reveal two hollowed halves fitted with shelves, which are perfect for storing paraphernalia while keeping it out of sight at the same time. 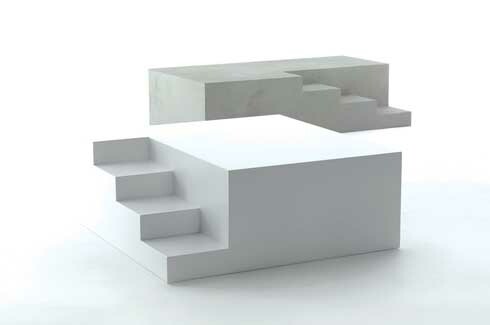 A design like this would work in every room – just imagine the possibilities! 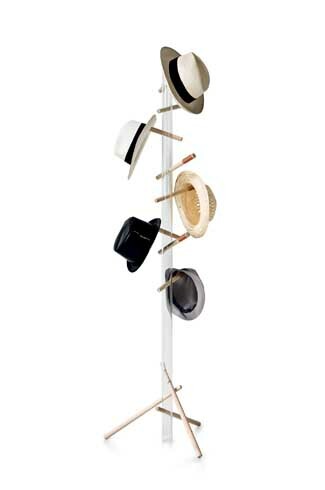 Mist-o’s range of products and accessories for the home are equally intriguing. 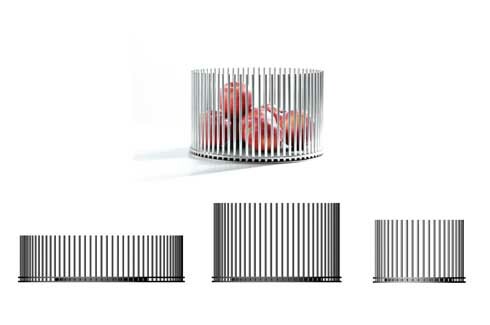 The ‘Prisoner’ range of fruit ‘Squares’ (2010) and ‘Bowls’ (2014) are made of aluminium and create a dialogue between the object and what it contains. “The fruit almost seems imprisoned in the embrace of the object, thus becoming a fundamental part of it,” explain the designers. 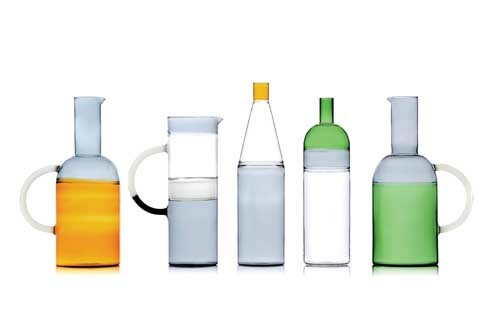 Mist-o has also created several collections of carafes and glass objects. The ‘Tequila Sunrise’ (2013/2014 for Ichendorf) collection of carafes in coloured borosilicate glass mixed with clear glass creates different layers which look as if the carafes have liquid in them already. 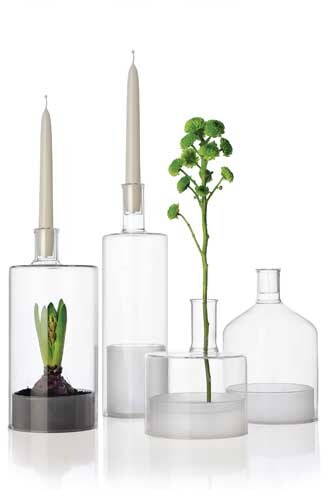 The ‘Tokyo’ collection (2013/2014 for Ichendorf) on the other hand is a collection of carafes, bottles, glasses and an interesting greenhouse/candle-holder in clear glass. Similarly, the ‘Atlantis’ vase (2014) is an interaction between two different materials – ceramic and glass. 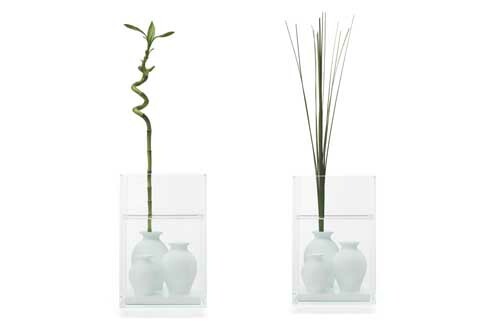 Three ceramic vases are “immersed” in a glass case which creates an underwater world with the flowers rising to the surface like the mythical lost city of Atlantis. “Besides being a decorative container for flowers, this creation seeks to enhance the value of the poetic act and ritual of floral composition and of giving life to cut flowers,” explain the designers. 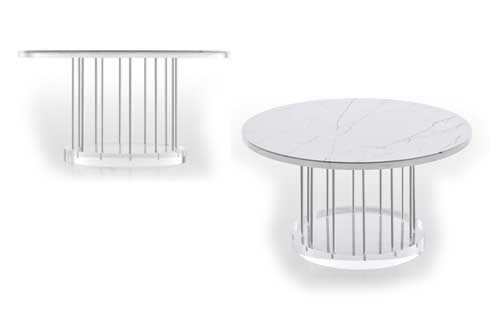 Apart from furniture and products for the home, Mist-o has recently branched into interior design with a Helicopter interior design exhibited in Milan. They have tried to apply the standards of living at home to the interior of the craft. 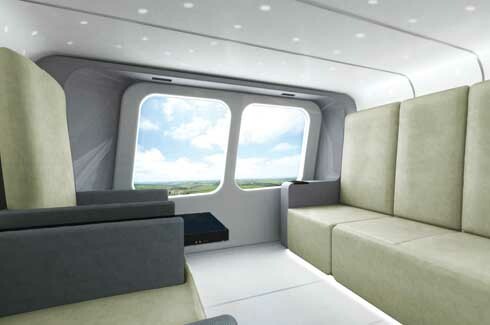 The space is thought of as being extremely flexible so that the seating composition can be changed around in order to give the passenger the facility of experiencing the cabin more freely. In this way one can choose what kind of trip one wants to make, whether it’ll be a business trip with a rigorous and formal arrangement or a more relaxed and family-oriented excursion with the seating corresponding to a living room. Mist-o’s intention of “communicating a vision of the world where things and relations arise from the union and meeting of different meanings and symbols” comes across clearly in their products. Whether it is a functional table or an elegant carafe for your kitchen, the essence and purity of Mist-o’s design shines through clearly.